This paper presents a new similarity measure based on Rao distance for color texture classification or retrieval. 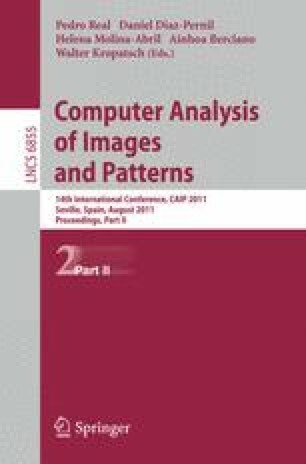 Textures are characterized by a joint model of complex wavelet coefficients. This model is based on a Gaussian Copula in order to consider the dependency between color components. Then, a closed form of Rao distance is computed to measure the difference between two Gaussian Copula based probabilty density functions on the corresponding manifold. Results in term of classification rates, show the effectiveness of the Rao geodesic distance when applied on the manifold of Gaussian Copula based probability distributions, in comparison with the Kullback-Leibler divergence. This work was supported by franco-moroccan CNRS-CNRST project STIC 05/10.